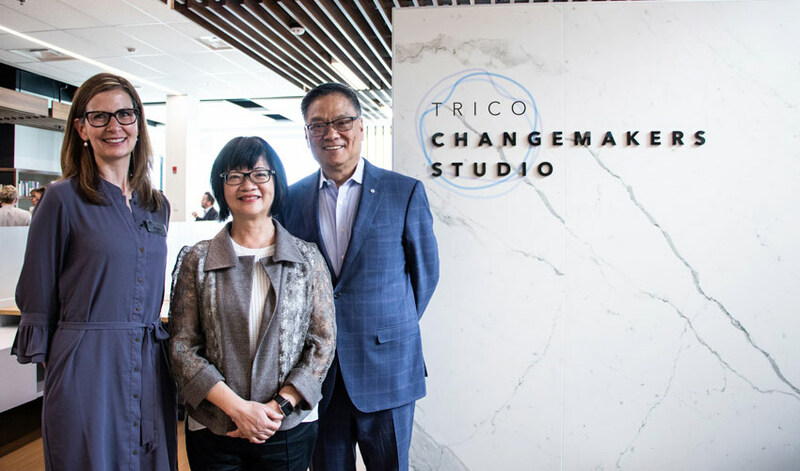 The Trico Changemakers Studio, located in the Bissett School of Business, held their official launch on Sept. 27, welcoming guests from on and off campus to tour and learn about the new 5,000 square-foot space. Studio director, Jill Andres, says the learning space is intended to bring together MRU students and faculty, as well as community organizations to address social and environmental challenges. Some current studio members include Alberta Health Services, Boys and Girls Clubs of Calgary, United Way Social Impact Labs and many more. A joint initiative between Mount Royal Bissett School of Business, Institute for Community Prosperity and Institute for Innovation and Entrepreneurship — the studio was funded by Trico Homes and the Trico Charitable Foundation who provided $1 million, as well as the Government of Canada’s Post-Secondary Institutions Strategic Investment Fund which supplied another $500,000. In her address to event attendees, Provost and Vice-President Academic, Lesley Brown spoke glowingly about the studio, its members, and the opportunities she believes the new space will offer. Calgary-Elbow MLA Greg Clark was also in attendance at the studio’s official launch to give a speech. The Trico Changemakers Studio is part of a broader changemakers campus initiative by the university which began in 2015. At that time, MRU created a Changemakers Campus Roadmap and has since been named a Changemakers Campus by Ahoka U, a designation held by only 50 universities around the world.